These pages are concerned with the day-to-day use of Linux instead of Windows in the academic environment. Specifically we use Kubuntu, because of this some of the details given here may not be transferable directly to other systems. LibreOffice is a fork of OpenOffice that appears to be more upto date. 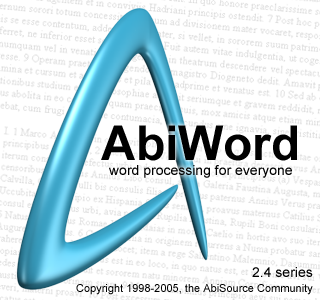 AbiWord is a much leaner, faster, but older, WP for windows XP and Linux. Crystallography A lot of X-ray programs are written for both Windows and Linux systems, including Pluton, Shelx, enCIFer, mercury. Spectroscopy Many programmes here - if you can't find a Linux version, then use a Windows one under Wine, or VirtualBox (see below). We use SpinWorks mainly for NMR analysis, although if you can get hold of the old version of mestrec it will run under wine. [A newer (commercial) version of mestrec (Mnova) is available which runs directly (not tested by us) under linux. For IR and Raman Nicolet's Omnic software works under Wine perfectly. Computational Chemistry Again, many programs are written to run on either Windows, Mac or Linux computers, from desktops to powerful servers. We use Avagadro on individual PCs to prepare data, GAMESS for ab initio calculations, GamessQ for job submission on PCs, and WebMO for submission to our server and wxMacPlt on PCs to view the output of calculations. This is very straight forward now, download the iso image from the Kubuntu download website, write it to a CD or DVD (this will obviously depend on what system you are curently using) and then restart your computer and boot from the CD. You can check things out before installing by running Kubuntu directly from the CD - albeit it slowly. There are numerous guides to doing this, including the Ubuntu guide. If installing Wine (highly recommended if you are migrating from Windows) then after installing Wine use adept etc to get WineTools - it greatly eases setting up Wine. A recent find was the truly excellent VirtualBox software of innotek GmbH this can be installed from the Kubuntu package manager (adept etc) and after a reboot it provides a virtual machine into which you can load other operating systems, such as Windows. 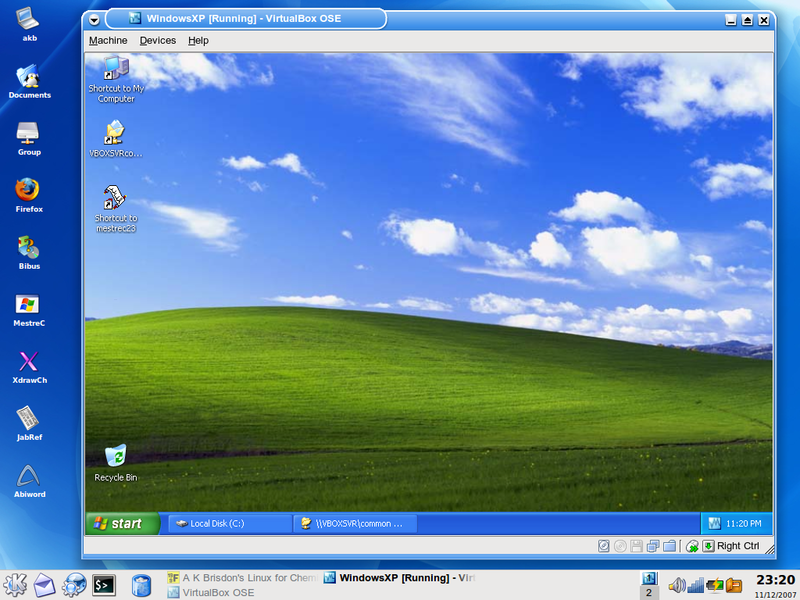 Below you can find a screendump of a PC running Kubuntu 7.04 and in a window Windows XP - that must be the definition of Windows! 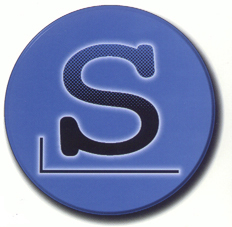 Slackware is our long-standing favourite, rock solid, Linux distribution. Brilliant for Servers! Kubuntu, the KDE version of Ubuntu is our other favourite, very easy to use, Linux distribution. Although not as powerful as OpenOffice, Abiword is a great, fast word processor.